Bring presentations to life! Students design and create videos in any content area and in any language either individually, collaborating with other in their class or school, and even with others around the world. There is no limit to the creativity and imagination that can be brought to any presentation resulting in a video to share. These collection of lesson are a great way to get started and check back with us frequently as we add more ideas to the NewsMaker portfolio. A great tool for building student confidence in presentations, oratory skills and improve critical thinking? 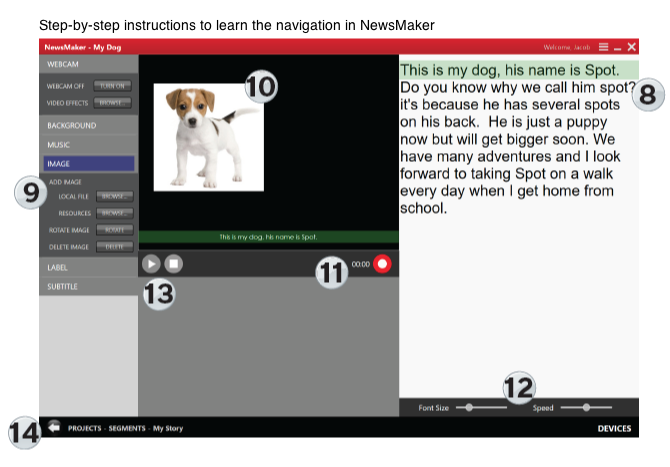 This first NewsCast is a perfect way to introduce the navigation of NewsMaker to your students. They will completed a simple activity with opportunities to explore and rerecord their segments. This ‘Newcast’ activity is a lot of fun and full of valuable learning, too. Students can share their presentations with their classmates and school. For even more fun, send the newscast home to share with each family what their children are learning in school.